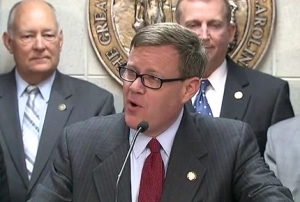 Public watchdog Bob Hall is raising attention about House Speaker Tim Moore’s land deal with a poultry company in Siler City owned by one of his major political donors. Hall wrote a letter and memo this morning to Wake County District Attorney Lorrin Freeman and Board of Elections and Ethics Enforcement Director Kim Westbrook Strach raising new questions for consideration as they continue to investigate the situation and examine the merits of the complaints filed by the Campaign for Accountability. The Washington D.C.-based Campaign for Accountability filed a complaint recently calling on state officials to investigate whether Moore acted improperly to seek preferential treatment from state regulators. You can read more about that here. Hall’s memo to investigative leaders includes a list of prior political donations from Ronald Cameron, of Little Rock, Ark., to Moore. Cameron owns Mountaire Corp., the nation’s seventh largest poultry company. Read the full memo below.